Hat / Helmet : You loose a lot of heat through your head, so having something to cover it is a must. Remember to pick something that will cover your ears, they tend to get cold too ! A helmet is something that is recommended for small children and for those of you who want to hit those off piste runs. Sun Glasses / Goggles : As the day goes on you will notice that your eyes will start to get effected by the glare. A pair of sunglasses will make sure that your eyes won’t be strained. Goggles can give you that little bit more protection from the elements, and in the low light of the afternoon skiing you will be able to see the bumps on the piste that little bit easier. Jacket: This needs to be waterproof and wind proof. If it has a snow skirt (a band that stops the snow going up into your jacket) it is a definite plus. Thermal top : Dressing for skiing is all about layer. Layering your clothes allows you to easily adjust how much you are wearing and to insure that you will always be the right temperature. When you are a beginner, and starting to learn how to ski, you will probably need less layers, because you will putting in more effort to stay on your feet and to get where you want to. Gloves: Good gloves are recommended. Gloves that are not water proof are simply not worth bringing with you. Temperatures on the mountain can reach -10°C once the wind starts blowing, and having gloves that will protect you will be more than welcomed. Skiing down off the mountain with cold & wet hands isn’t a lot of fun. Thermal underwear: These are a something that you should bring with you. Most pants are not lined and you will need something to keep your legs warm. Socks: Sadly this has to be said, GAA socks just won’t cut it. Make sure you have some big comfortable socks or a pair special ski socks when you are going on your skiing holiday. These socks have extra padding around the toes to keep you warm and around the ankles to pad them from your ski boots. Proper socks is something that will really make your day on the slope a lot more comfortable. Boots: Most important in buying or renting ski boots is that they are the right size. Boots should have a ‘snug’ fit, and have the possibility to be tightened. If you find that you are already tight in the boots, then you need to get the next size up. Try to stand on your toes and on your heals, if you find that there is some movement, then you try and tighten the boots a little more. Ski boots really need to be an extension of your feet, so do spend the time to find the right pair. A lot of these things can be bought online, and because they are small, they can be posted to you. We recommend Irish suppliers like MacSki.com, a Belfast based operator with 25 years of experience in the ski equipment market. Other handy things to bring with you skiing : sun cream , lip balm with UV protection and a good pair of walkie talkies. If you think I am missing anything from the list, please leave a comment below ! Hi am going skiing for the first time in feb. Am just wondering if anybody would know of any cheap but decent ski wear available. You should check TKmaxx they normally are good for a few bits and pieces. Great website, thanks for the great tips! I’m going skiing for the first time over Easter and I’ve got all my skiing geat but I’m still not too sure what to wear apres ski – i get it that it’s jeans and t-shirts in bars but i’ve been reading conflicting advice on online fora. I have uggs and trainers but is it likely i’ll have to walk thru snow in the evening on the way to clubs and bars? If so would i not need something waterproof and warmer? Friends have told me they’ve worn both and that ski boots are too cumbersome after wearing them all day. Also they told me to just wear my skijacket at night but then some comments online have said to avoid this in case it is stolen. Oh please help – I’m so confused!!!! I’d say you will be okay with your jacket / UGGS and runners. The less things you have to pack the better ! The snow should be cleared in most resorts, but it all depends on place to place as to how well they do it. I am currently shopping for my skiing jacket for christmas holiday. What to look for in choosing one? I’ll only be on the slope for a few days actually just to try it out. Is snow skirt compulsary? Hi Nelson, a snow skirt is not compulsory, but if you are a beginner it might be an advantage. When looking for a ski jacket you should get something water proof, durable, and wind proof. The snow skirt just stops the snow going up into your jacket, which is an advantage if you fall in deep snow, but may not be worth the extra cost. hi, im going on my first ski season this year but i havnt got any ski equipment yet. i know the great outdoors have some but do ye know of anywhere else to get womens ski and boots etc for as cheap as possible???? i have been online for the skis but u really need to try on boots before u buy…. I’m going on my first ski holiday and silly question but roughly how many layers should you be expectin to wear under ski suit? I presume it would be Thermal legs & vest, Tracksuit Pants, tshirt & hoodie or jumper?Also on getting the full ski pack is recommendable to get it through the travel agent or can anybody suggest cheaper options? hey im going skiing too in feb! Any ideas to help getting nice ski clothes?-Hate TKmakks so any other idea’s? Anyone know anywhere to get plus size ski wear ?? Tk Maxx is the best place to buy your skiing clothes… They have Jackets, trousers, gloves, hats… Basically everything you need… But the best thing is that everything is designer and great prices…. Dare2be jacket for 69.99Euro…..
I’ve got fairly good stuff on ebay this year. Do some research on the sellers, make sur they have good feedback. Got new pair of sallopets for €25 arrived today and they are perfect. Also go a new brand new Tresspass Jacket for €30 -bargin! Also good sale on in 53 degrees north at the minuet for nice branded stuff. Pennys have cool ski jackets and bottoms. Jacket €35 and bottoms €11. Loads of colours…..
hi, i just wondered do you wear your ski trouser under or over your ski boots when sking? my daughter is going soon for the first time and i have brought my daughter a pair but they are just a little short if going to be worn over boots but would be fine if under? Hi Claire, you normally wear the pants over the shoes. If you put then inside the ski boot, it might be uncomfortable as the pants would be strapped beside the skin. See this picture for a better idea. I have a snow skirt jacket that connect to my pants with clips. My friends are telling me they have an item that acts as a belt of some sort to help prevent powder from getting in. Does anyone know what this is called and where i can find it. Just FYI for anyone interested, Blarney Woollen Mills Cork selling off their Dare2B ski gear less than half price, jacket and pants reduced from 180euro to 59 euro, 67% off! God fab gear there today! ok …. im goin skking in america with my school next year in the easter and i really reall dont know what to bring. if i even think about it, i get so confused and i dont want to bring to much in my case because i will be doing ALOT of SHOPPING !! Well there is a list above which should help you, also you should join the forum, http://www.skiing.ie/forum/ and ask your questions there. Skiing is great fun, you are going to have a ton of fun on the slopes ! What you need to bring for skiing in america completely depends on what part of the country you’ll be. Also assuming your talking about the United States and not North America, since Canada would be different items. My son will be working on the slopes this winter~he is a southern boy and not used to snow ~ what clothing recommendations do you make? im going skiing in april with husband and 5 kids.ages 10,9, 6 4 2.our first time.hubby not gong to ski.. mind 2 yr old instead and enjoy apre ski! has anybody any tips to make it as enjoyable as possible for all ? Trespass in Stephens green have a sale on and have handy ski gear. Going to Soll in Austria skiing for Christmas. Has anyone been there at Christmas time or any other time. 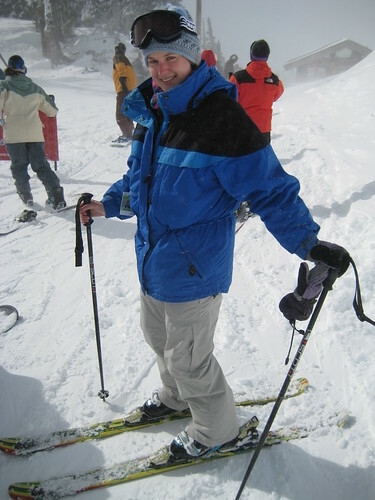 Hi Catz, check out out forum for discussions on where to go skiing in 2010-2011 season. Hi, I go skiing regularly and have to say that this information is just amazing for first-timers…I remember my first time, running around the place like a mad woman trying on all the big brands. I eventually got sorted and have quite a collection of ski gear at this stage! This year I’m going to Les Deux Alpes. It’s really super. The French people there are so nice. The North Face in Kildare Village has a few bits and pieces and Portwest is great for the economical yet robust choice. Happy skiing you guys! Let it snow, let it snow, let it snow!